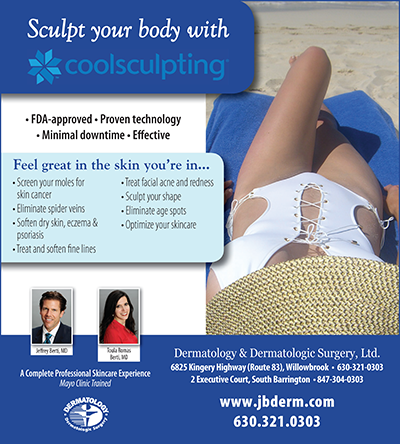 Interested in CoolSculpt? Click HERE for more info. You can also check CoolSculpting Fear No Mirror. We are now offering TruSculpt! The physicians at Dermatology & Dermatologic Surgery, Ltd. provide all their patients with a level of professionalism that is unmatched in today's medical offices or spas. A physician will evaluate your skin with each visit and a physician will provide and directly supervise all the procedures performed. It is the foundation of the medical training that both Dr. Jeffrey Berti and Dr. Toula Berti received at the Mayo Clinic that has ingrained this proper, professional and thorough attitude with which they approach every patient. Dermatology & Dermatologic Surgery, Ltd. was founded on the philosophy that every individual deserves to get the very best from their skin and body. Both Dr. Jeffrey Berti and Dr. Toula Berti strive to be a valuable and reliable resource for individuals who need information, treatments or procedures to help make their skin and body look and feel its best. Read more about Dermatology & Dermatologic Surgery, Ltd.